Natalie Lombard’s penetrating image of the battle between Truth and Lies adds thoughtful and invigorating art to your sewing room, den, office, or teen’s bedroom. 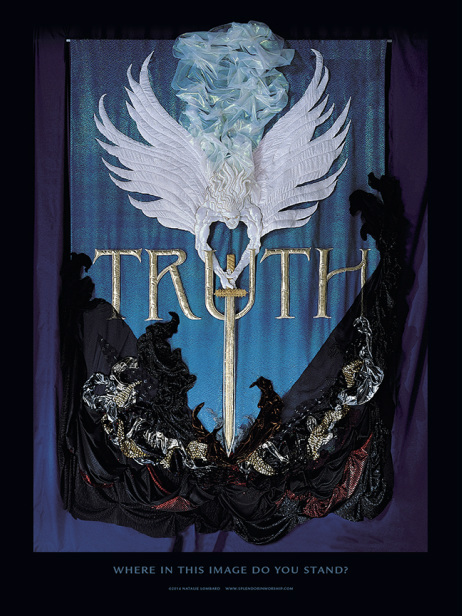 The Truth Banner poster will encourage your pastor, youth pastor, worship planners, church music director. It’s a stunning gift for your local government officials whom you may wish to encourage, thank, or challenge. The poster is available solely unframed to save you shipping costs, and to allow you to frame or mount it according to individual taste and room décor.